Microsoft’s Surface Book 2 was an unexpected surprise. Sure, the two-year-old original Surface Book was overdue for an update, though we still recommend the Book’s combination of power and long battery life even today. But after hearing that the two (yes, two!) Surface Book 2s will be way better than the original, we can’t wait to see what they can do. 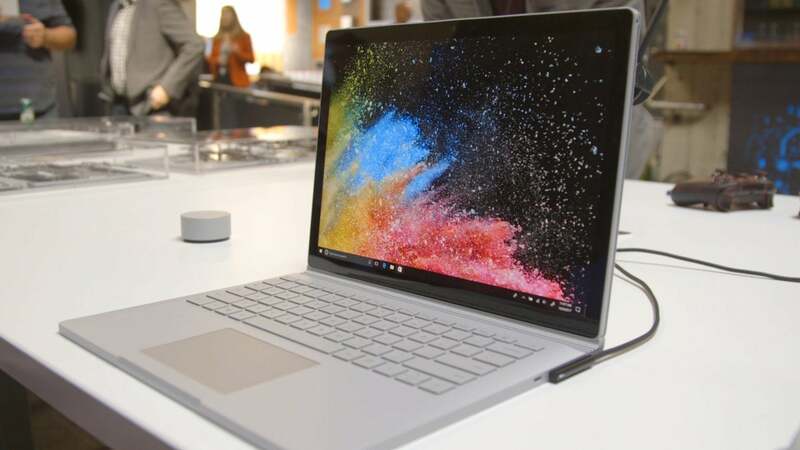 Microsoft’s Surface Book 2 aspires to repeat the original Surface Book’s theme, blowing users away with raw performance—only this time around, Microsoft claims the Surface Book 2 offers five times greater graphics performance than what the original 2015 model achieved. We took a close look at the new hardware at a recent press briefing and have all the information for you below: the specifications, the pricing and release date, and even our first hands-on impressions (with video!) of the product. You can use our index to the left to jump to a specific section. Be sure to check back: We’ll be updating this page with more specific details as they arrive, and eventually a review. Microsoft now has both a 13-inch as well as a 15-inch Surface Book 2. The fact that there is a Surface Book 2 is surprising enough, but two is an unexpected bonus. The two new Surface Book 2s include a successor to the original 13-inch form factor plus a new 15-inch model. 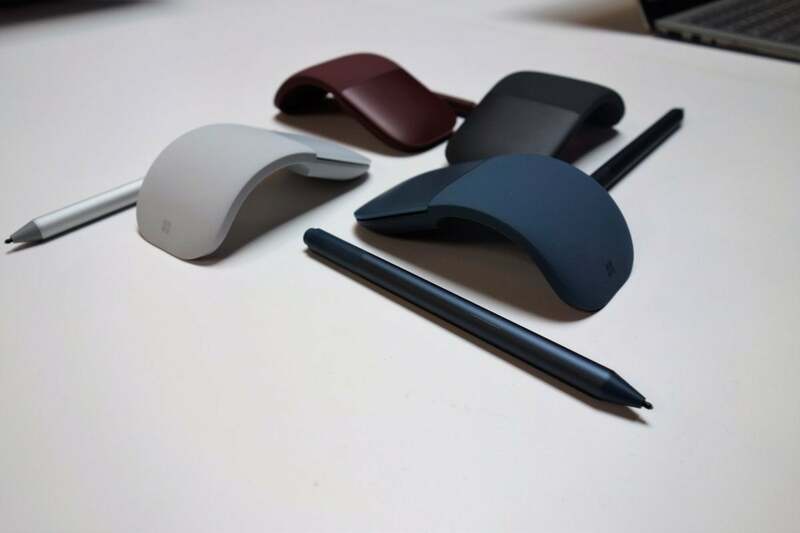 Microsoft also has two peripherals they’re selling alongside the Surface Book 2: the Next Generation Surface Pen ($100, like the old one) with 4,096 levels of pressure sensitivity; and the Surface Precision Mouse, a $99 mouse that reminds me of older mice like the Logitech M510. Note that refurbished, older Pens cost as little as $33. Surface Book 2 preorders started November 9 for shipments on November 16, with one catch: Microsoft’s 15-inch Cadillac of convertibles will ship only to U.S. customers, at least initially. As a two-in-one convertible tablet, the Surface Book 2 can be detached into a tablet mode. Dimensions and weight: The new Surface Book 2s look virtually identical to the original. The 13-inch Book 2 measures 12.3 x 9.14 inches, and 0.59 to 0.9 inches deep—essentially the same as the first Surface Book. It weighs between 3.38 and 3.62 pounds, depending on the model. The 15-inch Surface Book 2 measures 13.5 x 9.87 x 0.57 to 0.9 in. and weighs 4.2 pounds, or 1.8 pounds for the tablet alone. Naturally, the two Surface Book 2s ship with Windows 10, specifically the Creators Update. Processor and graphics: As Intel rolled out its 8th-generation Core processors, many began to wonder when Microsoft would refresh the Surface Book with an 8th-gen Core chip. Well, wonder no longer. Only the cheapest $1,499 Surface Book 2 model has a 7th-generation Core chip inside it, the 2.6GHz dual-core Core i5-7500U. In fact, that’s the only Surface Book 2 with an integrated GPU, too. All of the other 13-inch and 15-inch models are powered by the 8th-gen, 1.9GHz quad-core Core i7-8650U, and discrete graphics chips. 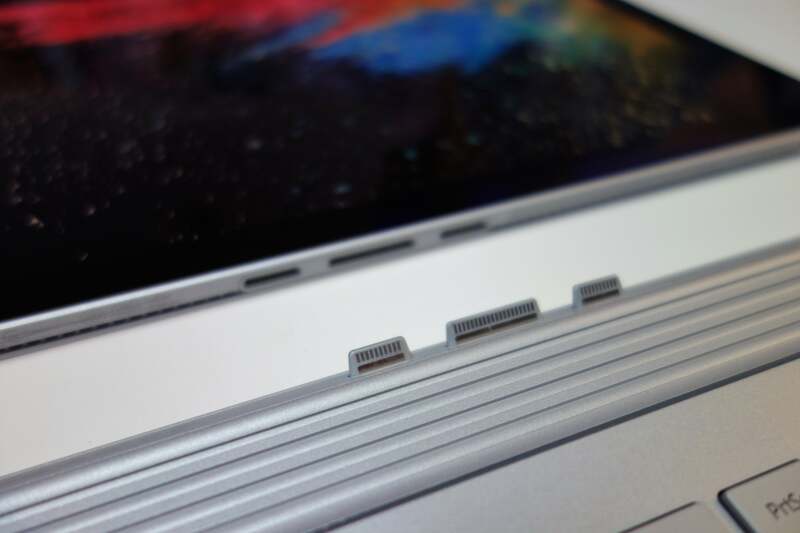 There’s a nice bonus across all of the Surface Book 2 line, too: All of the tablets are fanless, though the bases aren’t. 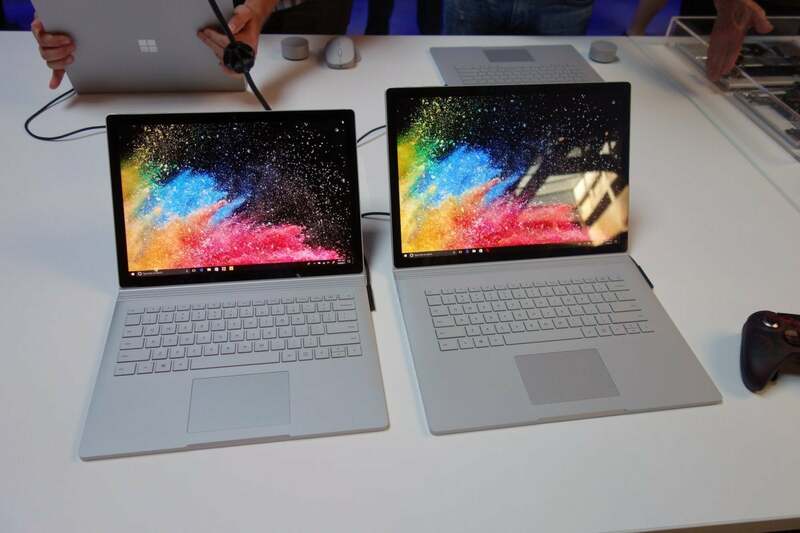 The 13-inch Surface Book 2 includes the Nvidia GeForce GTX 1050 (2GB), while the 15-inch model Surface Book 2s include the GeForce GTX 1060 (6GB). (PCWorld reviewed the GTX 1060 card in 2016.) That GTX 1060 is what provides five times more graphics performance than the original Surface Book, Microsoft says. Memory and storage: Surface Book 2 buyers can purchase models with either 8GB or 16GB of 1,866MHz LPDDR3 memory, and either 256GB, 512GB, or 1TB SSD options. Display: The similarities between the Surface Book and the Surface Book 2 extend to the display, which still hasn’t reached the 4K threshold. The standard 3,000 x 2,000 (267 ppi) 13.5-inch PixelSense display graces the 13-inch model, while a 3,240 x 2,160 (260 ppi) 15-inch display is built into the larger model. Microsoft hasn’t said anything about its color gamut, such as whether it will be able to switch between DCI-P3 color and RGB. One of the Surface connectors is reserved for connecting the tablet and the base. 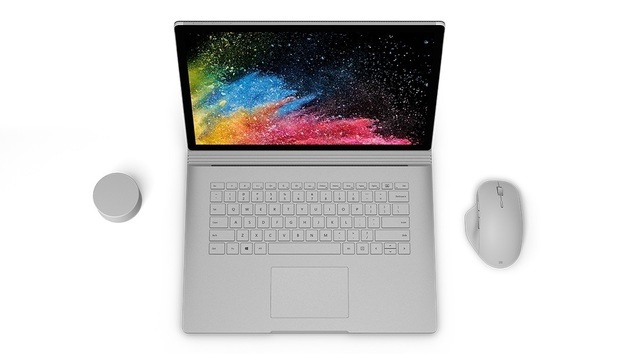 Connectivity and cameras: Both Surface Book 2s include the expected connectivity options: 802.11ac and Bluetooth 4.1 LE. The 15-inch model, though, includes something special: integrated Xbox Wireless, so that an Xbox One or Xbox One X wireless controller can be connected to the Surface Book 2 for playing games. Both the tablet and the base together contain the usual complement of ports: two USB 3.0 Type A connectors; a SDXC card reader, a 3.5-mm headphone jack, and two Surface Connect ports. (One Surface Connect port connects the base to the tablet, so it isn’t usable in laptop mode.) There’s also something new: a single USB Type C port for data, and charging in and out. It is not Thunderbolt-compatible. What’s missing? The miniDisplayPort port that’s graced every Surface until now. A pair of USB Type A ports are still on the left-hand side of the Surface Book 2. The Surface Book contained both front and rear cameras, and the 5MP front-facing camera (1080p video capable) and the 8MP rear-facing camera are the same as on the original Surface Book. Windows Hello capabilities are built into the front-facing camera. Dual mics are built into the front of the tablet, and a pair of front-mounted speakers within the tablet are Dolby Audio Premium capable. Keyboard key travel is 1.55mm, we’re told. What is the Surface Book 2? 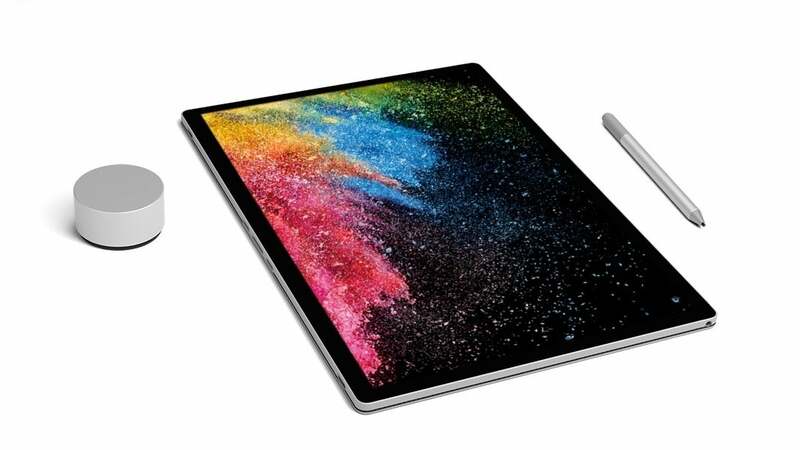 The Surface Book 2 is the successor to the original Surface Book, one of the most powerful machines in Microsoft’s Surface roster. It was high time for an upgrade, though, and Microsoft refreshed the Surface Book’s innards, while leaving everything else mostly unchanged. Highlights include the new 8th-generation Core chips, powerful discrete graphics, a USB-C port, and a massive 17-hour battery lifespan. The 13-inch Surface Book 2, compared against the larger 15-inch model. How is the Surface Book 2 different than the Surface Book? Externally, the two are much the same. 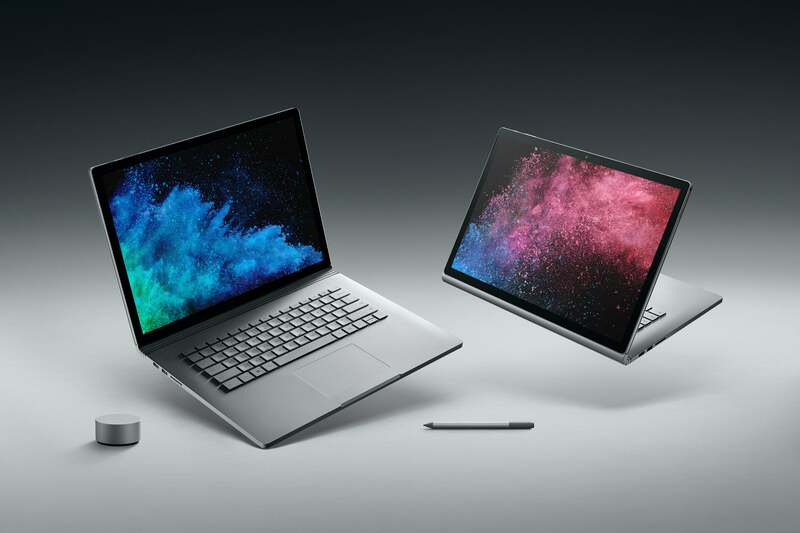 But the Surface Book 2 now ships in a larger 15-inch form factor as well as the original 13-inch form factor, and adds Intel’s latest 8th-generation Intel Core chips. All but one of the 13-inch and 15-inch models ship with either a discrete Nvidia GeForce GTX 1050 or GTX 1060, for performance that’s up to five times faster than the original Surface Book's. How does it differ from the Surface Laptop and Surface Pro? The Surface Laptop also emphasizes long battery life, but it’s geared at students, with less of an emphasis on graphics performance. The Surface Pro (revamped for 2017) is a more traditional tablet, lighter and thinner and emphasizing mobility above all else. Who should buy the Surface Book 2? 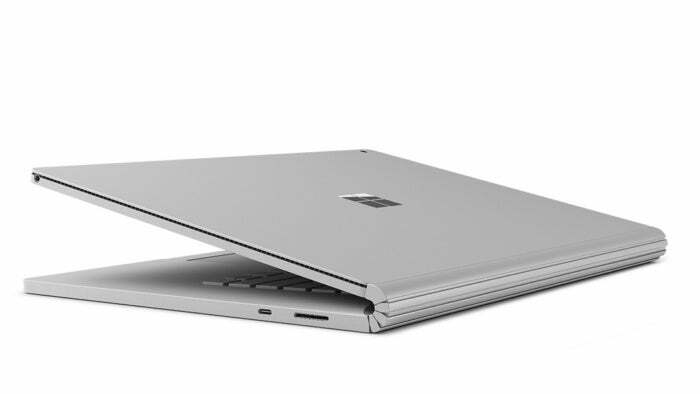 The Surface Book 2, like the original Surface Book, is designed for professionals who crave a high-performance laptop-like experience, but with massive battery life as well. The fact that the tablet can be detached almost feels like an afterthought. How does the Surface Book 2 compare to traditional laptops? Until we test it, we won’t know for sure. But consider the Surface Book’s performance against gaming laptops like these, many of which haven’t even made the leap to 8th-generation Core chips. How fast is the Surface Book 2? We don’t know, as we haven’t tested it. But we have one benchmark that can shed some light: Gears of Wars 4. 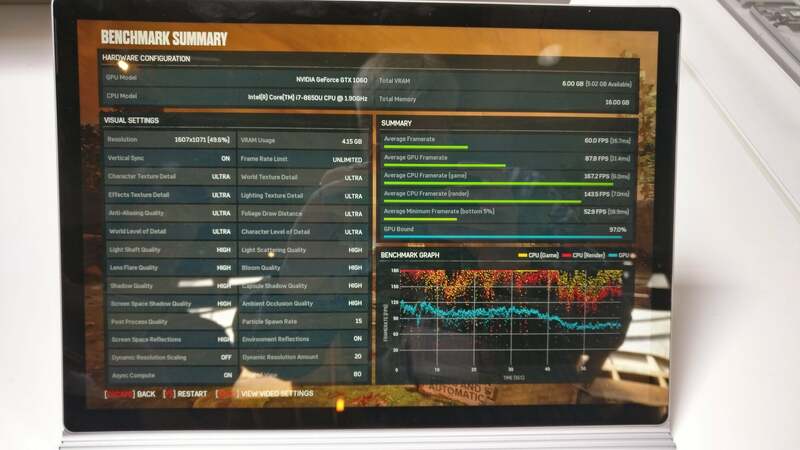 The Surface Book 2 runs GoW4 at a solid 60 frames per second at Ultra and High settings, while the original Book ran GoW4 on low settings, and barely. That’s a solid improvement. Should I buy the Surface Book 2? Hang on a little longer! We expect our review to be published sometime on or before the Surface Book 2 launch on November 16. Though the Surface Book 2 weighs more on paper, it didn’t feel substantially heavier in the hand. I would have sworn that the edges were slightly rounded, and that the backlit keyboard keys were slightly scalloped. Upon closer inspection, though, that appeared to be a trick of the light. 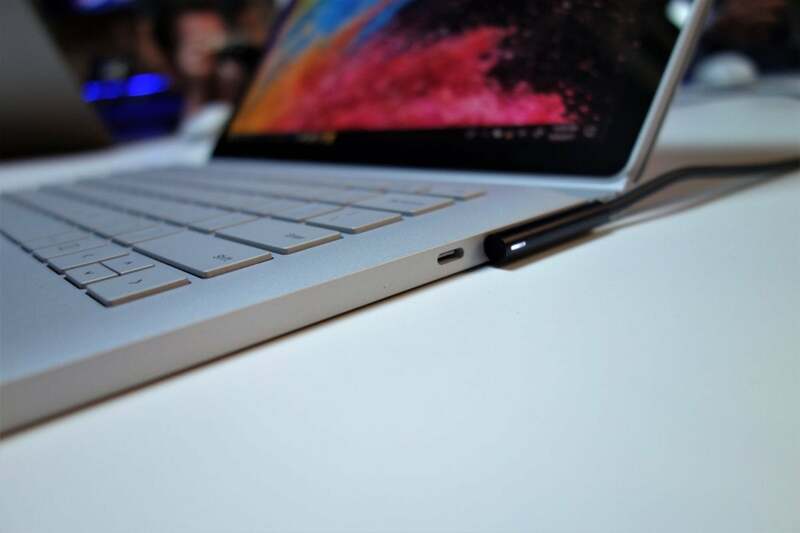 The Surface Book 2’s key travel is 1.55mm, Microsoft says. There’s also a bit of a surprise: a USB 3.1 Type-C port, a first for Microsoft’s computers. That USB-C port supports power and video, according to Microsoft’s documentation. Small improvements crop up everywhere you look. The hinge (which still leaves a bit of a gap) appears a bit more articulated, and the tablet disconnects a bit faster. (The “muscle wire” that holds it in place now works more consistently across different temperature ranges, too.) 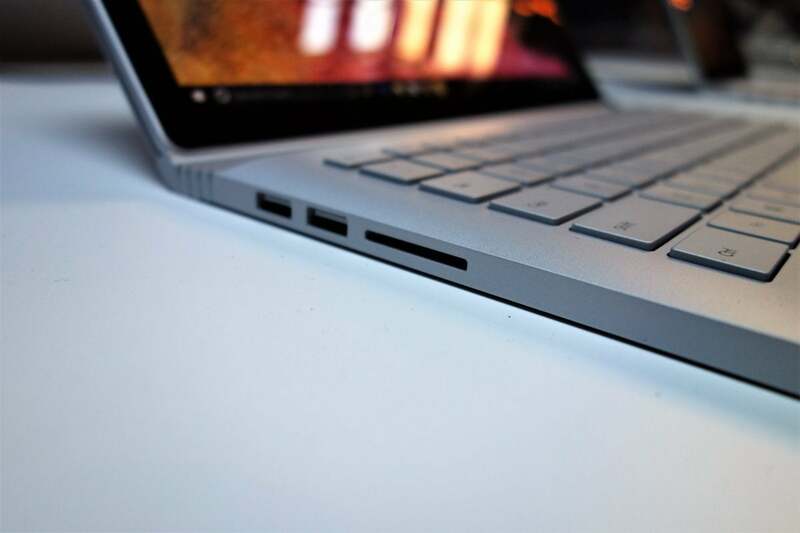 The Surface Book 2 reclines to the same angle as the original, officials said. The Surface Book 2’s raw horsepower—4.3 teraflops—naturally means it can be used to play games as well as create content. “These products are for the creator that sees no limit... you want to dream, do not let the performance get in your way,” Panay said. We won’t know how fast the Surface Book 2 is until we get one in for review. But Microsoft showed off the Surface Book 2 running two video games at its preview: Cuphead, and Gears of War 4. 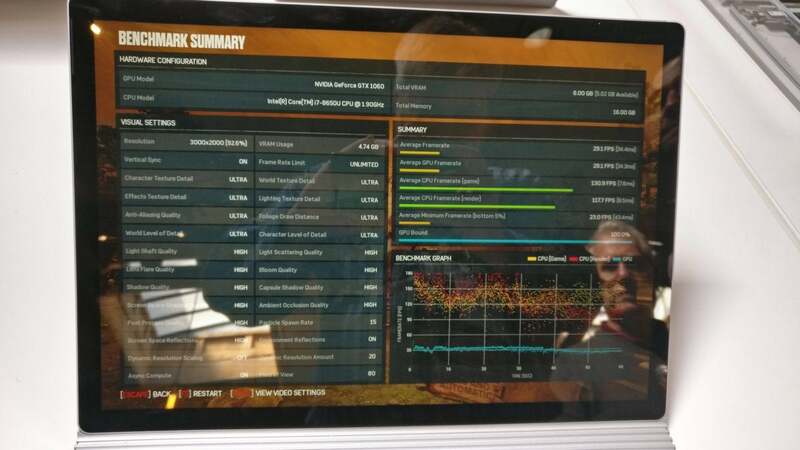 The latter is the most interesting, as it contains an integrated benchmark mode. So we ran it. The bottom line: The 13-inch Surface Book 2 looks and feels like the original Surface Book. The 15-inch Surface Book 2 feels appropriately massive, though, giving the whole thing a sense of weight to match its under-the-hood performance. We can’t help but feel a little trepidation about the hardware issues Microsoft’s Surfaces sometimes suffer early on, but fingers crossed regardless. While I didn’t have a chance to try out what Microsoft calls the Next Generation Surface Pen, Microsoft officials assure me that it’s more sensitive, with 4,096 levels of pressure. It ships in metallic silver with blue accents, as well as three other colors. What’s nifty about the mouse is that it can be dynamically set for either smooth scrolling, or the notched scrolling that provides haptic feedback. 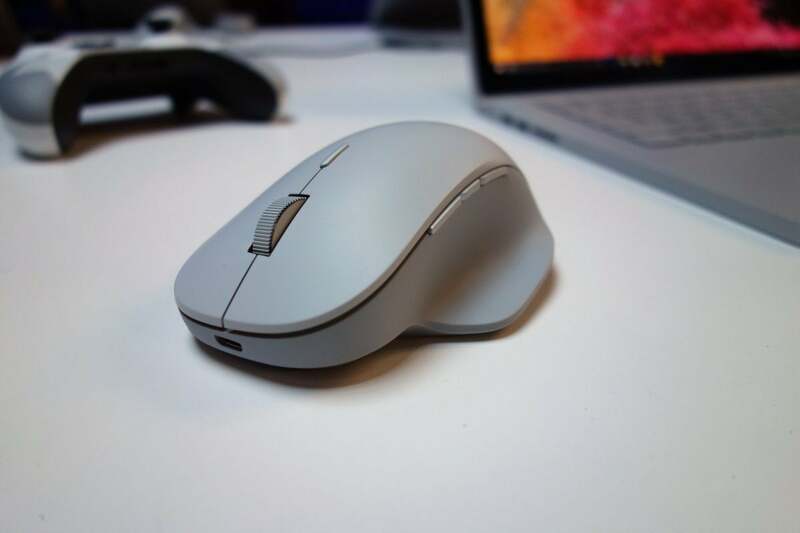 Microsoft didn’t provide battery life details, though the mouse appears to use microUSB to recharge. It felt great in the hand, though favoring righties was a little disappointing for this southpaw. What’s next? Hopefully, a review for all of these. Check back frequently, as we’ll compile all of the news about the Surface Book 2 here. « Mingis on Tech: The iPhone X - best phone for business, or best phone ever?